Aluminium has become a crucial part of the global economy. In the United States alone, aluminium (Al) and its alloys contribute more than $174 billion to the economy every year. This figure represents close to 1% of the country’s entire economic output. Why are more engineers deploying aluminium alloys? Aluminium brings a number of unique benefits, making it the most widely deployed light alloy in industry. One of the major strings to aluminium’s bow are the social and environmental benefits. Aluminium is helping businesses around the world manufacture more sustainably. It’s widely recycled, much more than heavy metals and even other light alloys. For this reason, a significant proportion of aluminium that has been chemically extracted in human history is still in use today. The advantages are not solely environmental, though. Mechanically, aluminium has a number of advantages over heavy metals and even other light alloys. It has an exceptional strength-to-weight ratio combined with good levels of formability, enabling its use in a wide variety of applications. Naturally, it forms an oxide layer which extends its life in non-acidic environments, too. And now, with the advent of innovative surface treatments for aluminium, the material is being deployed in even more testing conditions. Al alloys are frequently replacing heavier metals like steel, which are often selected for their performance in challenging use cases. Aluminium offers a range of beneficial properties while uncoated. However, there are several drawbacks to aluminium which have historically limited it to certain use cases. Naturally, aluminium is a fairly reactive metal. Due to the material’s chemical affinity for oxygen, aluminium alloys oxidise readily, forming a protective layer of aluminium oxide. This layer provides some corrosion resistance in pH neutral environments – however, in alkaline or, in particular, acidic environments, this layer does not provide sufficient protection. Certain aluminium alloys are more susceptible to corrosion than others. The 2xxx and 7xxx series are both prone to galvanic corrosion, due to the containing high levels of copper and zinc contents respectively. It is not just corrosion resistance that has been highlighted as a potential weakness. Aluminium’s vulnerability to friction-initiated wear is an issue of concern, too. This makes advanced coatings, and surface engineering, compulsory in many applications where friction is produced from abrasive wear (contact between components). This is important where aluminium alloys are used against other metals. Various electroplating techniques have been used over the years to enhance the properties of aluminium. Some of these have proven more effective at improving corrosion resistance than others. Other techniques have been outlawed, due to their use of toxic chemicals and the carcinogenic chromium. 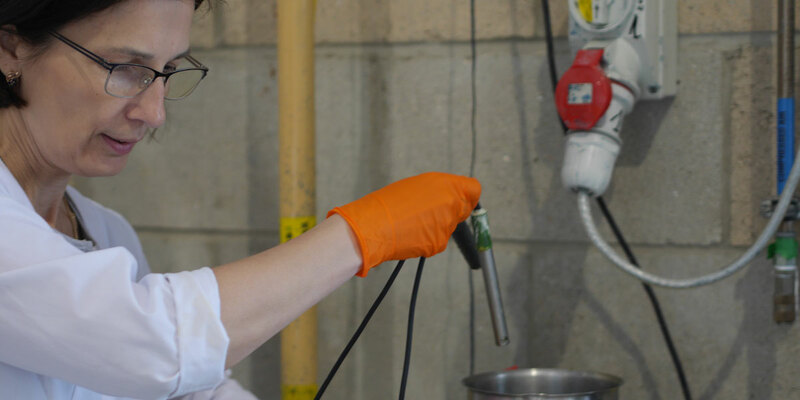 Electroplating is a well known electrochemical conversion coating process. There are several forms, including electroless and electrolytic techniques. In short, metallic ions are incorporated on the surface of the aluminium substrate to provide it with greater wear resistance and tribological performance, among other characteristics. When uncoated, aluminium coatings tend to offer poor adhesion to further coatings after forming an oxide layer. It’s the lack of adhesion between layers that can make the metal prone to galvanic corrosion. This causes electrical conduction to drop, and weaken bonds with other metals - particularly if they have a large differential in their anodic index. One method of preventing galvanic corrosion is plating with metals that are highly resistant to corrosion, like nickel. The effectiveness of nickel plating depends almost wholly on the application. Electroless nickel (EN) plating is an alternative to conventional electrolytic electroplating, and currently one of the more popular types of autocatalytic, chemical plating for aluminium. Used widely from computer motherboards to submarine engineering, Electroless nickel coatings deliver high-hardness, ductility, and abrasion resistance – ideal for sliding wear applications. However, one of the main drawbacks of the technique is that the cleanliness of the substrate is a factor in the success of the coating. Any bacteria or direct will impact the quality of the coating. For more complex and intricate parts, this tends to raise several issues, for example in cylinder liners, whereby the inner surface area is difficult to clean. Also, EN plated aluminium is difficult to recycle, as the plating needs to be removed with mechanical or chemical stripping. Anodizing is perhaps the most conventional method of improving the performance of aluminium alloys. In more intensive applications, a ‘harder’ anodizing approach is used. 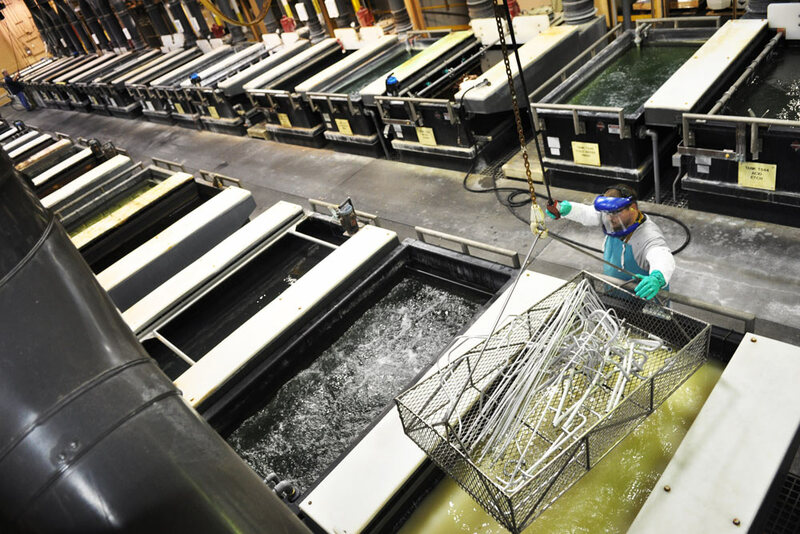 Hard anodizing involves the use of sulphuric acids and other additives to produce thicker, harder, anodized layers. This helps improve hardness and wear resistance while moderately improving corrosion resistance. Hard anodized coatings are characterised by their distinctive microstructure. During their formation, coatings grow vertically, producing a columnar microstructure. The greater the thickness (height of these micro-columns), the better the protection provided from corrosion. In applications that require a combination of corrosion and wear resistance, this micro columnar structure can cause issues – especially when wear has reduced the thickness of the coating and has left gaps to the substrate. Figure 1. Anodized coating surface microstructure (right; Coating by plasma electrolytic oxidation, by comparison). 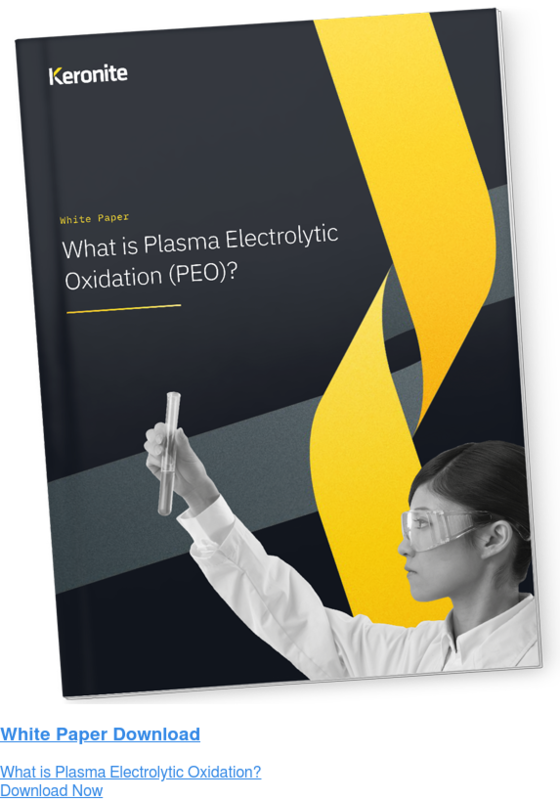 Plasma electrolytic oxidation (PEO) is a technique that shares many of the same principles of hard anodizing, but the incorporation of plasma-chemical reactions creates coatings with a set of characteristics. These characteristics offer significant advantages over hard anodizing and plating techniques. The coatings formed through PEO are incredibly hard, wear resistant, adhesive, and provide an excellent ‘key’ to improve adhesion to subsequent coatings. It’s this key that allows PEO-induced ceramic layers to act as the perfect complement to subsequent layers, thus improving corrosion resistance. Furthermore, the 3-stage coating process is far more flexible than other comparable techniques, allowing for its use in a wide variety of applications and to achieve bespoke-to-application characteristics. For example, the composition of the electrolyte bath can be modified to introduce new materials into the coating for specific applications. The dynamism of the technique has attracted leading companies from the automotive, aerospace, consumer electronics and defence industries to adopt use the technique. The technique offers a range of environmental advantages. By nature, the PEO process involves no toxic chemicals, and electrolyte solutions are typically benign, allowing for easy disposal. For this reason, the coating received a surge in interest from leading aerospace manufacturers following the planned eradication of toxic hexavalent (VI) chrome from the industry. Companies seeking REACH and RoHS compliance may consider PEO an apt alternative to these prohibited coating techniques. Aluminium has rightly earned its place at the top of the light alloy food chain. Its use looks set to continue and even expand, now it is even being incorporated within moving components (like engine blocks) to reduce weight. Materials science companies like Keronite are continually developing new solutions for light alloys like aluminium to enable their use and extend their life in challenging applications. Businesses seeking to improve the performance of light alloys, or to reduce the mass of their products should always begin the project with an investigation into light alloys and their surface treatments. It could spring a few surprises to learn just how well light alloys can perform with innovative surface technologies, like plasma electrolytic oxidation.